Woodstock, VT – Sugar Season signifies the end of winter in Vermont as warmer weather brings flowing sap for the creation of Vermont’s famous maple syrup. This spring maple takes center stage with sweet savings at The Woodstock Inn & Resort located in the heart of Woodstock, VT. From a family-friendly vacation to an elegant romantic escape, the resort’s Sugar Season Escape packages allow guests to indulge in the luxury of The Woodstock Inn & Resort to welcome the spring season. Woodstock celebrates all things maple during Maple Madness Weekend, March 28 and 29, with festivities at Suicide Six including Sugar on Snow, a maple taste-a-round and even a muddy bike ride. Guests interested in learning more about maple syrup production can visit nearby Sugarbush Farms and take-in the sugar house tours, explore a nature trail to see the sugar maple trees, and sample four grades of 100% pure Vermont maple syrup. The Sugar Season Escape package includes: Luxury accommodations at The Woodstock Inn & Resort; Hearty country breakfast for two each morning (Midweek rates starting at $169/room/night; Weekend rates starting at $199/room/night). The Sugar Season “Extra Sweet” package includes: Luxury accommodations; breakfast; $100 spa credit per room, per night ( Midweek rates starting at $239, Weekend rates starting at $269). Sugar Season “Suite Deals” package includes:Luxury Suite accommodations;breakfast; bottle of wine upon arrival; a taste of maple welcome amenity ( Midweek rates from $299, Weekend rates from $329). Packages run March 8 through May 28, 2015. To reserve this package, call 855-238-6954 or book online http://www.woodstockinn.com/Specials-Packages Booking restrictions apply. Activities at the Woodstock Inn & Resort include a 41,000 square foot Racquet & Fitness Club, complete with indoor tennis courts and racquetball courts, a 30-by-60 foot indoor lap pool, a whirlpool, workout equipment and a steam room and a sauna. The 10,000 square-foot LEED-designed spa offers a nature-inspired ambiance, nourishing treatments, organic products and a great room for spa-goers to enjoy. Guests can dine at Richardson’s Tavern, which offers a cozy old-world atmosphere with a full bar. The Red Rooster, the resort’s award-winning fine dining restaurant, emphasizes fresh, local ingredients sourced from the best purveyors in New England. The new game room brings out the kid in everyone featuring a wall-size scrabble board, vintage pin ball games, shuffle board and bar service from Richardson’s Tavern. For additional information become a fan on Facebook at www.facebook.com/Woodstock-Inn-Resort, visit www.woodstockinn.com or call the sales department at 802-457-6632. 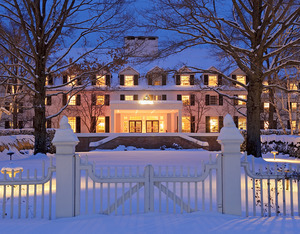 The Woodstock Inn & Resort is offering festive, value-added packages for visitors to enjoy another enchanting holiday season in Woodstock, VT. Winter events officially begin with Wassail Weekend, December 7 – 9, 2012, named one of Vermont’s top 10 winter events by the Vermont Chamber of Commerce. Wassail Weekend highlights include a holiday crafts fair, Yule Log and memory tree lighting and a walking house tour of six notable Woodstock historic homes that welcome visitors inside for rare peek of seasonal décor. In the evenings, the Campbell Brothers gospel group takes the stage at Town Hall, while local actors perform a Christmas Vaudeville show at the Yoh Theater. The main attraction is Saturday’s town-wide parade with more than fifty horses and riders dressed in holiday attire and costumes from the early 19th century. Additionally, throughout the weekend Billings Farm & Museum offers hands-on experiences such as making historic Christmas ornaments, candle dipping and horse-drawn sleigh or wagon rides, weather permitting. A two-night minimum stay is required, rate does not include Vermont states taxes and per day resort fee. To book the special package, visit www.woodstockinn.com or call (888)-481-8802. Also, the Woodstock Inn & Resort is offering a pre-holiday B&B Package for guest to relax and rejuvenate before the holidays with rates starting at $179 per night, a savings over 30%. Woodstock Inn resort offers an idyllic experience during the Christmas season with wreathes and decorations adorning the property, a soaring tree and a roaring lobby fireplace. During Christmas week guests can choose from Alpine or Nordic skiing, rejuvenating in The Spa at the Woodstock Inn & Resort and picking up last minute holiday gifts on Main Street. Children will be occupied with daily activities in the game room, swimming in the indoor pool and more. The Inn will also be hosting a sumptuous Christmas Day dinner with all the traditional fixings. Throughout the winter season Woodstock Inn & Resort provides guests with a number of dining and recreational options to enhance their stay. The Red Rooster, the resort’s award-winning fine dining restaurant emphasizes a menu using fresh, local ingredients sourced from the best purveyors in New England. Richardson’s Tavern offers a cozy old-world atmosphere with a full bar and live music. Resort activities include Suicide Six, a 23 trail mountain, the Nordic Center which offers more than 60-kilometers of cross country skiing and a 41,000 square foot Racquet & Fitness Club, which includes indoor tennis courts, indoor racquetball courts, a 30-by-60 foot indoor lap pool, a whirlpool, workout equipment and a steam room and a sauna. The 10,000 square-foot LEED-certified spa offers a nature-inspired ambiance and treatments including the signature winter selection, Deep Forest, which features a gentle exfoliation of the body and is followed by a massage. Located in idyllic Woodstock, Vermont, the Woodstock Inn & Resort defines country sophistication in one of New England’s most charming and popular year-round vacation destinations. The 142-room, AAA Four Diamond Resort and member of Preferred Hotels & Resorts, offers award-winning dining in three restaurants, ranked among the finest in New England. The Woodstock Inn & Resort is owned and operated by The Woodstock Foundation, Inc. Proceeds from Resort operations support The Woodstock Foundation and Billings Farm & Museum education and conservation programs. Rates start at $164 per night midweek and $194 per night on weekends. The special is valid March 11, 2012 through May 24, 2012. The resort features 142 distinctive guest rooms outfitted in classic Vermont style with modern touches, four restaurants, and The Spa. Woodstock offers a 18-hole golf course with picturesque views from nearly every green. Travelers will appreciate the abundance of culturally rich activities in and around Woodstock. Downtown Woodstock is filled with antique shops, art galleries, boutiques, restaurants, specialty food markets and more. Guests can enjoy day trips to nearby points of interest such as Calvin Coolidge’s birthplace in Plymouth or the spectacular Quechee Gorge, also known as Vermont’s “Little Grand Canyon.” For those who want to explore the great outdoors there’s hiking, biking, tennis and more. For more information visit woodstockinn.com or call 1.800.448.7900. Woodstock, Vermont celebrates the holiday season with its annual town-wide Wassail Weekend held December 9-11, 2011. The Woodstock Inn & Resort is offering a special package for guests to enjoy this enchanting holiday celebration including tickets to see the highly acclaimed Vienna Boys’ Choir. Woodstock, Vermont celebrates the holiday season with its annual town-wide Wassail Weekend held December 9-11, 2011. The Woodstock Inn & Resort is offering a special package for guests to enjoy this enchanting holiday celebration including tickets to see the highly acclaimed Vienna Boys’ Choir in one of their only New England performances this year, indulge in a traditional holiday feast celebrating Charles Dickens and enjoy a performance of the play Scrooge! based on Charles Dickens’s, A Christmas Carol. Accommodations (two night minimum stay required; tax and gratuities extra; other restrictins may apply). The Woodstock Inn & Resort will be hosting a Charles Dickens-themed Wassail Feast Saturday evening followed by a play called Scrooge! by Leslie Bricusse based on Charles Dickens’s, A Christmas Carol. The Wassail Feast will feature traditional English fare with a local Vermont flavoring including Roasted Mutton (garlic studded leg of lamb with rosemary and caper sauce), Dicken’s Chicken (curry chicken and rice casserole), Tatties & Neeps (mashed turnips and potatoes with ginger) and Chocolate Bread Pudding. With a history spanning over 500 years, the Vienna Boys’ Choir is one of the oldest and most renowned boys’ choirs in the world. On Friday, December 9, they will be performing contemporary and classic holiday favorites. Billings Farm & Museum, which is free to guests of The Woodstock Inn & Resort, will be showcasing Vermont life as it was during the 19th Century including an authentically decorated 1890 Farm House tour, traditional music and sleigh or wagon rides. Festival highlights also include a town-wide Wassail Parade on Saturday with more than fifty horses and riders dressed in holiday costumes and period dress from the early 19th Century. Woodstock’s most charming and historic houses open their doors for guests to experience their New England hospitality and holiday decorations during the Holiday Homes Tour on Saturday. Shops in the Village of Woodstock are often open late, providing guests’ ample opportunity to wrap up any last-minute holiday shopping. Along with the Wassail Weekend activities, The Woodstock Inn & Resort provides guests with a number of recreational and dining options to enhance their stay. The Woodstock Inn & Resort is now home to a new 10,000 square-foot LEED-designed spa, offering a nature-inspired ambiance and featuring nourishing treatments and organic products. In celebration of Winter, guests can experience the 100-minute Deep Forest treatment which begins with an exfoliating body scrub and hydrating wrap and ends with a full-body massage. Guests can dine at The Red Rooster, the resort’s award-winning fine dining restaurant which emphasizes fresh, local ingredients sourced from the best purveyors in New England. Guests can also enjoy downtown Woodstock filled with antique shops, art galleries, boutiques, restaurants, specialty food markets and more. For more information, visit www.woodstockinn.com or call (888) 481-8802. Summer is peak festival season in Vermont and The Woodstock Inn & Resort’s Wake Up In Woodstock package offers value and flexibility for guests to enjoy any number of events. Wake Up In Woodstock includes accommodations, breakfast, welcome gift, admission to the Billings Farm & Museum, admission to the Marsh-Billings-Rockefeller National Historical Park and complimentary use of the Inn’s Racquet & Fitness Club. Guests will also enjoy one complimentary appetizer per room in The Red Rooster for dinner. Prices start at $282 per night based on double occupancy. The Woodstock Inn & Resort is hosting its annual Summer @ Six Concert Series at nearby Suicide Six (pentanglearts.org). The concert series kicks off Friday, July 22 and Saturday, July 23 with a bluegrass festival featuring performances by Grammy-award winner bluegrass singer-songwriter Peter Rowan; bluegrass virtuosic instrumentalist/singer/songwriters Sierra Hull & Highway 111; David Grisman, famed acoustic string instrumental musician; The King of Newgrass Sam Bush; Ricky Skaggs & The Kentucky Thunder; The Bluegrass Gospel Project and The Infamous Stringdusters. On Friday, August 26, the Levon Helm Band headlines the second Summer @ Six concert with special guests Assembly of Dust, Bow Thayer and the Perfect Trainwreck. Billings Farm & Museum has a full calendar of events throughout the summer including Foodways Fridays from July 15-October 14 where visitors can learn how to use heirloom vegetables from the garden in historic recipes prepared in the 1890 Farm House kitchen. Celebrate National Ice Cream Day July 17 where visitors can lend a hand making and tasting the ice cream (billingsfarm.org). For a full listing of events in and around Woodstock, visit woodstockinn.com/the-resort/events. The Woodstock Inn & Resort is now home to a new 10,000 square-foot LEED-designed spa, offering a nature-inspired ambiance and featuring nourishing treatments and organic products. In celebration of Summer, guests can experience the 100-minute Signature Berry Bliss Treatment which begins with an exfoliating body scrub and hydrating wrap and ends with a full-body massage. Resort activities include a 18-hole Robert Trent Jones designed golf course, a 41,000 square foot Racquet & Fitness Club, which includes indoor and outdoor tennis courts, indoor racquetball courts, a 30-by-60 foot indoor lap pool, a whirlpool, workout equipment and a steam room and sauna. Guests can also enjoy downtown Woodstock filled with antique shops, art galleries, boutiques, restaurants, specialty food markets and more.